ASEAN is a lifeboat for all 10 countries in South-east Asia to come together, Prime Minister Lee Hsien Loong said yesterday, on the cusp of Singapore's helming the group. ASEAN, which turned 50 this year, is a vehicle "to have our voice heard on the world stage and to be able to manage our own issues among ourselves, and to cooperate to improve the lives of the people in South-east Asia", he told Singapore reporters. 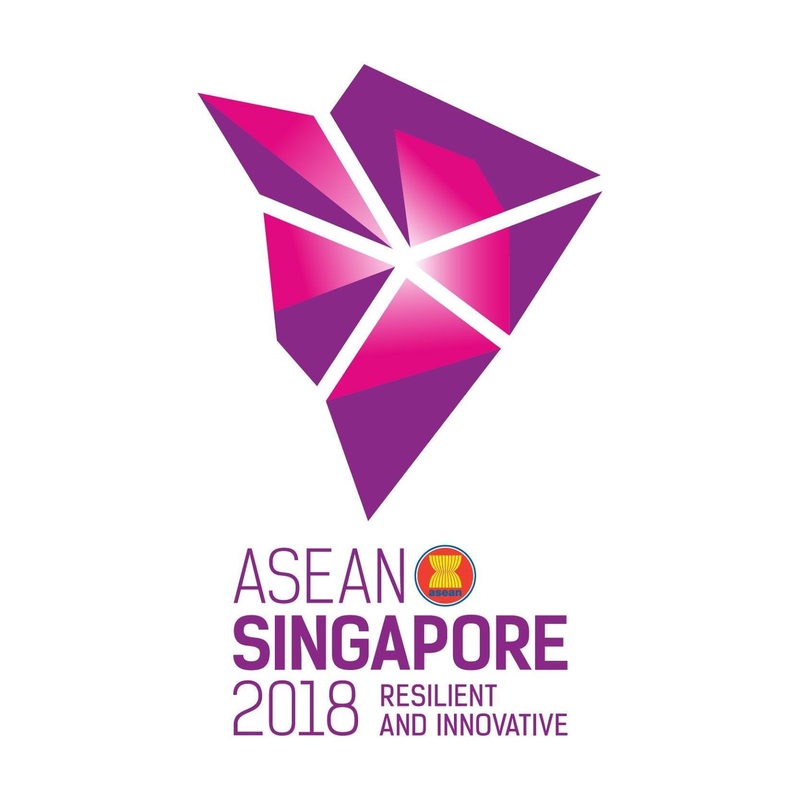 He also outlined Singapore's key priorities as chair, captured in its tagline "Resilient and Innovative", in a speech at last night's closing ceremony for the 31st ASEAN Summit, the last major event on ASEAN's calendar this year. Philippine President Rodrigo Duterte, the host, gave him a symbolic gavel to mark the hand-over of the rotating chairmanship. PM Lee said Singapore, as ASEAN chairman next year, will seek to ensure the group promotes and upholds a rules-based regional order. This is to better deal with emerging security challenges in the neighbourhood, such as cyber security, transnational crime and terrorism. Singapore will also steer fellow members to press on with regional economic integration and enhance connectivity, so as to keep the region competitive and prosperous. And it will find innovative ways to manage and make use of digital technologies, and equip ASEAN citizens with skills and capabilities. The goal, he added, is for ASEAN to remain a central and dynamic driving force in the region that can deal with challenges and opportunities. Singapore will also continue to build relations with ASEAN's external partners, PM Lee added. If it can make ASEAN more effective and strengthen cooperation with its neighbours, this will benefit the man on the street, he said. "It means for Singapore a stabler world to live in, a safer South-east Asia in which we can operate, a more prosperous region in which we can grow our economy, expand our markets and seize opportunities which will be there," he said. PM Lee also congratulated the Philippines for its successful chairmanship. A major highlight was a framework for the Code of Conduct of Parties in the South China Sea. Building on this, ASEAN and China agreed to start talks on the code, both sides said at the ASEAN-China Summit with Chinese Premier Li Keqiang on Monday. These talks will begin early next year, PM Lee told Singapore reporters yesterday. ASEAN leaders also held their first summit with United States President Donald Trump. PM Lee said these showed that "ASEAN values our relations with these two powers, and these two powers are also paying attention to their relationship with ASEAN". ASEAN leaders also pledged to protect the rights of migrant workers. Trade was featured prominently, as leaders spoke of the need to send a signal of commitment to free trade and open markets. They acknowledged the hurdles in the way of concluding talks on the ASEAN-led Regional Comprehensive Economic Partnership, and PM Lee said Singapore will do all it can to push negotiations forward. He thanked ASEAN Secretary-General Le Luong Minh, whose term is ending soon, and his staff and welcomed his successor Lim Jock Hoi, Brunei's permanent secretary for foreign affairs and trade. "Singapore looks forward to working closely with you and the secretariat to strengthen ASEAN's community-building efforts," said PM Lee. He also told reporters that Indian Prime Minister Narendra Modi, whom he met yesterday, had agreed to visit Singapore to speak at the Shangri-La Dialogue next year. "I'm very happy to say that he looks forward to coming, and we'll be working on it." On a cold and rainy day yesterday, warm food was particularly enticing. At the Experience ASEAN festival at Bishan-Ang Mo Kio Park, the crowd headed for stalls selling dishes such as Singapore laksa, Vietnamese pho and Myanmar mohinga - a rice noodle and fish soup. More than 30 food stalls serving up dishes from around the region drew more than 5,000 people to the event, which launched Singapore's chairmanship of ASEAN. 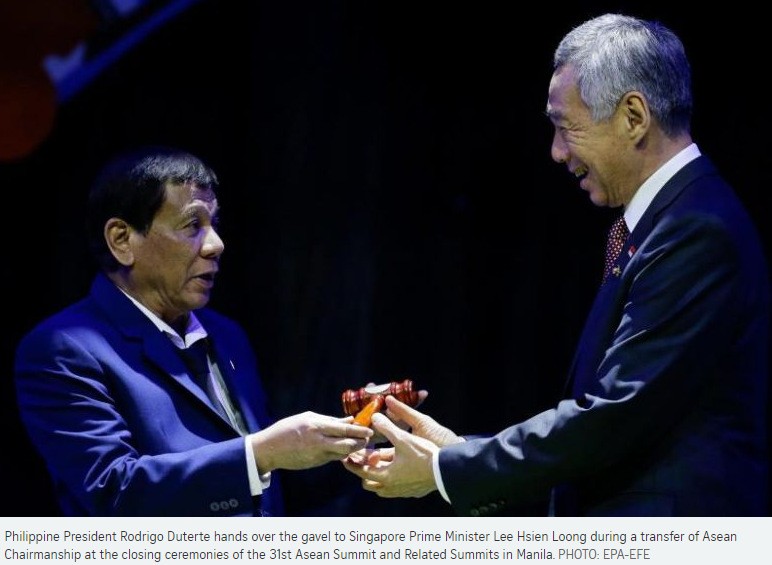 As Prime Minister Lee Hsien Loong highlighted in his speech, food items from the region - like Thai rice, Vietnamese coffee and Filipino dried mangoes - are readily available in Singapore at "very affordable prices", thanks to the free flow of goods and services among ASEAN countries. This is among the ways that people have benefited from the 10-nation grouping, which has brought peace, economic growth and prosperity to the people in the region since it was formed in 1967, he said. "ASEAN has benefited all of us who live in South-east Asia, including Singaporeans," he added, expressing the hope that Singaporeans would get to see more aspects of the grouping this year. 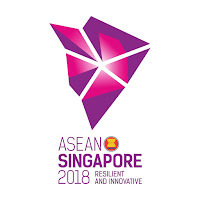 As ASEAN chair, Singapore will start projects to strengthen the region's resilience against common threats such as terrorism, cyber crime and climate change, and promote schemes to help member economies innovate and use technology, he said. Singapore "will do our best to take the group forward", in line with the chairmanship themes of resilience and innovation, he pledged. Tracing the grouping's history, he said South-east Asia was "far from being a tranquil place" before Indonesia, Malaysia, the Philippines, Thailand and Singapore came together to form ASEAN. Singapore had just separated from Malaysia; Konfrontasi - or confrontation - waged by Indonesia was barely over; and the Vietnam War was threatening to spread to the rest of the region. Brunei, Vietnam, Laos, Myanmar and Cambodia joined later, bringing ASEAN membership to 10. Had the region remained troubled by conflicts, said PM Lee, Singapore, a small and vulnerable country, might not have survived. He added that ASEAN has increased the region's influence internationally. "We have been able to engage major countries like the United States, China, India and Japan to pursue mutual cooperation and to deal with problems which concern us all," he said. ASEAN's economic community has also opened up many jobs and business opportunities. With the ASEAN Free Trade Area, for instance, companies here can reach a combined market of 630 million people, more than 100 times Singapore's population, he said. The three-day festival aims to bring ASEAN closer to Singaporeans through performances and food. Administrative executive Mok Chingny, 36, was there with her six-year-old son to introduce him to the different cultures of the region. Philippine Ambassador Joseph Del Mar Yap told The Straits Times: "After our successful chairmanship of ASEAN last year, we are relieved at being able to pass on the baton to Singapore, whom we know will do a great job in steering the organisation." ASEAN's chairmanship rotates annually, and Singapore was last chair in 2007. During this term, the Republic will have to grapple with some thorny issues, such as the humanitarian crisis in Myanmar's Rakhine state that has strained ASEAN unity.